My oldest son turned four on Sunday! We were camping at Sam's parents house, so we decided to have a party and celebrate next weekend instead. We really debated over whether or not to tell Henry it was his birthday, and of course we decided to because WE were so excited about it. But I think it just confused him a little. He knows he's having a party next week, so that must be his birthday. And to Henry, birthdays = cake. So until there is a cake, he's not four! I thought I would celebrate with a few pictures from Henry's baby-hood! 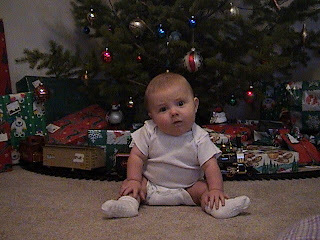 Here's Henry's first Christmas--he was about six months old and not sitting up on his own very well, so he fell over a few times before I got this picture! This is about 9 months old. 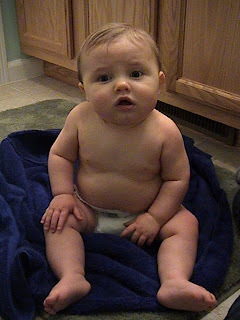 He was such a cute, round little baby! I just realized that he isn't smiling in this picture, or the one before it! We really had to work hard to capture his winning smile on film. Henry was at least two before we could convince him that it was a good idea to smile for the camera! Here's the sweet smile I mentioned earlier! And those blue eyes--the girls are gonna be weak in the knees! Here's a more recent picture. Note the crayon behind his ear. I asked him about it and he said, "See, mommy, I'm just like Daddy!" Henry got his first real bike a month or so ago. He was so excited that he rode it across the parking lot to the car! So that's it for pictures. Henry is a wonderful child--he is full of life and love, has a great imagination, is always looking out for others, and never fails to make us laugh! Henry has a personality that draws people in. When we had him dedicated as a baby, a woman in our church came up and said that she had a word for us (his parents). She said that the holy spirit had put it in her heart to share with us that many people would be reached for the kingdom of God through Henry, that he would touch people from many countries. I don't know how exactly that will play out, but his personality is shaping up to make it happen! I am so glad that God has placed Henry in our care, and I pray daily for wisdom in his upbringing, and thank God for the joy he brings our family. I love you Henry! Just a few updates on what is going on in our lives . . . . . This boy is binky-free! It sort of just happened. He asked for it one afternoon and I said "Silly boy, you don't need that right now." And then he never asked for it again. Sam and I both thought surely he would ask again at bedtime, but he didn't. And now it's been almost a week! Nothing much new with this one. He makes us laugh every day. Yesterday he told Jonah, "I love you. 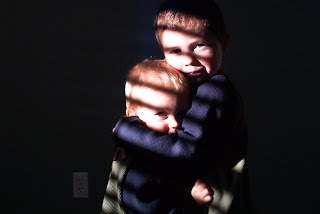 You're my best brother in the whole world!" What a sweetheart! Washington was great! We had SO much fun visiting my mom. The weather was beautiful (65 degrees and sunny the entire time!) and the boys and I were only a little bit cold. :) Guess we really are Texans after all. Finally got to see my mom's new condo--it is really cool, right on the waterfront. It was so very pretty to wake up every morning and watch the birds out on the water and see the boats going by! I was honestly shocked that it didn't rain on us the entire time we were there. We got to do some fun things. We walked on the boardwalk and looked at some of the navy ships that were docked there. I didn't get a picture, but we drove by two aircraft carriers that are being worked on in Bremerton--those things are amazing! The boys didn't quite believe us that they were floating--they just thought they were buildings down by the water. Here's some more of Henry's budding photography skills! He took a few pictures for us this week, and I think he did a really great job! The zoo was a highlight for the boys . . . .
We got to see my Grandma and eat at my favorite place on earth (my uncle's drive-in hamburger stand in Olympia). We also got the chance to see my paternal Grandma (someone I haven't had much contact with over the years, as I don't even know my dad). We spent some time at my Aunt Sandy's store, which was Henry's favorite--he thought she was SO LUCKY because she had so many toys (she imports things from China and has lots of cool stuff)! Also we saw my Aunt Ida and one of my cousins and her daughter (who is about the same age as Henry). All that family time was pretty fun for me. We don't have a family that gets together very often, and the few times they have had occasion to be in the same place at the same time over the last few years have coincided with the births of my children. So I haven't been able to make it over there. It was a great trip. We were home for a day and then we left (with Sam this time!) on another quick vacation. This one was to Arkansas with Jon and Kelly, and we drove--so it was a pretty low-key vacation. Pretty fun! We were blessed with beautiful weather and the chance to relax and enjoy a bit of nature and a little time out on the water. I don't have any pictures in the computer yet from this weekend, but I'll tell you the highlight for us: we saw a mama deer with her two little fawns just up the road from our cabin! They were the cutest little things, and they were pretty young--they could hardly walk still. If the pictures of those turn out I'll be sure to post them later on! I know I've posted this picture before, but it's one of my favorites. And just maybe you missed it the first time around! Tomorrow morning, the boys and I are headed in one direction, while Sam goes in another. We are going to visit my mom in Washington State (yay!!) and Sam is going to work at an Acquire the Fire event near Washington D.C. As my father-in-law pointed out last night, this will be the farthest we've ever been away from each other! The boys are SO very excited! Henry especially has a really close bond with my mom, and he can't wait to see her. When he was little my mom lived nearby, and she helped out so much with him. She is his very favorite person to call on the phone! I'm also excited to be able to see some extended family members that I haven't seen in a very long time. It will be fun to catch up a little and let them meet my kids! I'll check back in with y'all (the Texan coming out in me!) next week sometime and maybe post some pictures from the trip. Take care all and God bless you! Yes, sir yes, sir. Three bags full. I love the relationship that my two boys share. Today I thought I would post a picture of the boys at their favorite place on Earth . . . . . . .McDonald's (with a playland, of course!). The one closest to our house has two ways to climb up--one for bigger kids and one for littler kids. Jonah can't quite make it up the bigger side yet (he's too short), but that doesn't stop him! He goes over to where he can't reach and says, "Henry, help!" and Henry patiently grabs him by his britches and boosts Jonah up, then follows him up and does it again, over and over. It is so sweet to watch. I love seeing these two boys interact and grow their relationship! We traveled up to Kansas on Sunday to be there for Kelly's mom's funeral on Monday morning. One of Wanda's family members spoke on her generous gift of organ donation. He talked about the people that had already been touched by it and those that will benefit from it in the future. As we were driving back home to Texas, my husband brought up the subject of organ donation. (He has always been a little uncomfortable with the idea, and a few years back he even suggested that I take my organ-donor sticker off my driver's license.) All this to say that he has had a major change of heart and now wishes to be an organ donor if the situation ever arises. When I asked what had changed his mind, he said it was seeing all the good that came from it and hearing about the lives that Wanda had touched. I think that is an incredible tribute to a wonderful woman.